I can remember the very first time that I heard Metallica’s Master of Puppets album. I was 14 and a half. The half, at that age, was really, really important. I had probably been listening to heavy metal for about two years, maybe a bit more, maybe a bit less. I had records by AC/DC, Iron Maiden, Queen (yes, I know, they aren’t heavy metal) and Black Sabbath (yes, I know, THEY are). I had read about Metallica in Kerrang! magazine. They had ripped jeans! They drank booze! They looked like the coolest kids on the planet. Actually, I was the kid and they looked liked what I wanted to look like when I was older. I thought they looked like the best thing ever. They looked brilliant because they looked normal. They looked like what a spotty adolescent with a fascination and love of heavy metal would want to look like when they reached their early 20's- let’s be fair, when you’re 14 (and a half), 23 seems aeons away. I can remember the nerves as I went to place the needle on the vinyl. This was pre internet days. Nerves because I didn’t want to scratch a record that I had saved my pocket money up to buy. Nerves because I had no idea what this was going to sound like. I hadn’t heard one note of Metallica’s music before I played Master of Puppets. This was back in the day when you chose a record based on what you thought would make you the coolest member in your gang. This was in the days when you bought a record because of the artwork and what you thought it might sound like. This was in the days when you bought a record that you hoped might annoy your dad the most. It was always your dad you wanted to wind up, wasn’t it? Nerves because you’d told everyone that you were going to buy it and you wanted it to sound like the best thing ever but a small part of you was terrified that you MIGHT NOT LIKE IT but you’d have to justify why it was amazing, even though you didn’t really believe it was. On this matter at least, I could relax. I can’t remember how I felt after hearing the record for the first time. I knew that I wanted to hear it again because there was so much to take in and so much that I wanted to explore but fear that I had missed so much. I think I played it five times that day. The thing about Master of Puppets was that it sounded like other bands but, equally, sounded like no other band. No other band that I had heard, up to that point, at least. This was a band that wasn’t writing about the vagaries of love like many of their contemporaries; this was a band writing about war, insanity, drugs, violence. When you’re 14 and a half this is the most exciting ever. This was a lyric sheet to be read, re-read and devoured. A lyric sheet to be memorised, to be quoted in the school playground and to be scrawled over exercise books. Remember those? Listening to Master of Puppets was a journey into a collective, dark imagination. From the the pounding Battery, through the heavy metal masterpiece of the title track; the dark, uneasy tentacles of The Thing That Should Not Be; the venomous anger that underpins (Welcome Home) Sanitarium, the crashing and corrosive belligerence of Disposable Heroes; the expressive instrumentation of the epic Orion; the breathless bellicosity of Damage Inc; for a record as long and ambitious as it is, it doesn’t feel like one note is wasted from neck-breaking start to breathless, what-the-hell-just-happened finish. It was, as you’ve gathered, my favourite record then. It probably still is now. Over time, like all great art, my relationship with Master of Puppets has changed and evolved. I know the record like the back of my hand but I always find moments and passages to rediscover and reacquaint with. I know- because I’d drawn it on the back of an exercise book- that my initial favourite song was Damage Inc but I’ve spent many an hour debating the merits of the title track, Battery, (Welcome Home)Sanitarium. Currently, I will bow to no-one in my admiration for Leper Messiah. Don’t ask me why, it just is.You will have your own favourites, no doubt. 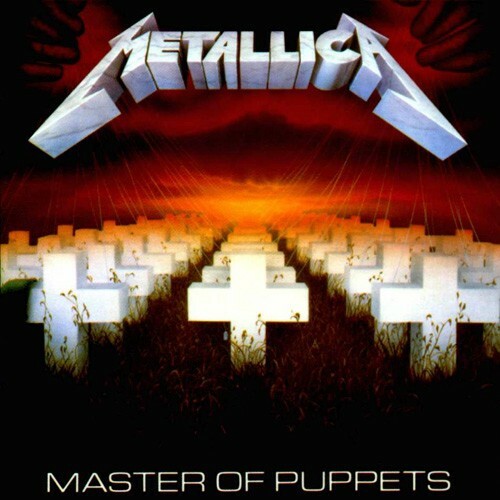 Metallica might have made thrashier records (Kill ’em All), bigger selling records (Metallica), more ambitious records (…And Justice For All) but there is an eternal truth in the adage that you never get a second chance to make a first impression and, for me, Master of Puppets was that first impression. It might be a generational thing, it might be a nostalgia thing. Know this: it is an emotional thing. Oh and, yes, it still annoys my dad. Thanks for reading. You can get updates from me, via email.